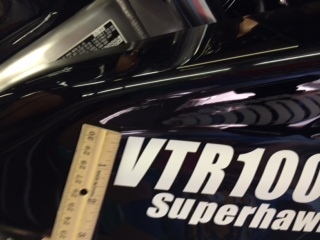 I have been playing around with the graphic's plotter at work and cut out a a few sets of VTR1000F Superhawk decals. Veranda, italic, bold in white font size 150 on the VTR and 80 on the SH decal. I have one extra set available. If your interested send me a pm, 20 bucks shipped to your door. If time permits I will be fine tuning the decals so most likely there will be more styles and colors in the future. can you duplicate the font and size of the oem decals? please let me know if you can provide the "superhawk 996" decal. does anyone know what the actual size of the oem decals are? Last edited by Wicky; 10-18-2016 at 10:18 AM.